One midsummer night. Two strangers. Three rules: No real names. No baggage. No phones. A whirlwind twenty-four-hour romance about discovering what it means to feel alive in the face of one of life’s greatest dangers: love. Even If The Sky Falls by Mia Garcia is a book that I read at an interesting time in my life. You know how sometimes something stays with you just because of what you were going through? Well, this is the book that I read before going into labor and finished after I had my child. So, it is a book that was there at a significant part of my life. And frankly, I do not regret that. I am glad I picked a pretty good book to accompany me during a fairly important time. Further, even if I didn’t read this during an important time, Even If The Sky Falls does stand quite well on its own merit. Mia Garcia’s debut novel follows Julie as she is in New Orleans on a service trip, I think if I recall correctly, with her church group? Anyways, so, Julie is feeling a bit stifled with her group. The leader is this super obnoxious guy who was friends with her brother and just will not leave her the F alone. So, Julie sneaks off into the city. And it is the night before the mid summer Mardi Gras festival. Julie puts on a pair of fairy wings and is ready for adventure. She finds it with this boy named Miles who is in this band. The two decide not to use real names and instead explore New Orleans for one night. Only, plot twist, there’s a hurricane coming and that definitely is going to have an impact. I feel that characterization is important with books that are set in a twenty four hour time frame. So, to me, it mattered that Julie was a character that felt three dimensional. We learn that she has been through some stuff. I mean, as a result of her brother who returned from a deployment with PTSD and a drinking problem, not to mention a violence problem. He does something that causes Julie real pain and to close herself off to her friends. We don’t find out immediately, but it is developed over time. So, as Julie gets to know Miles and his baggage, as well as some other characters, we get to see her grow. We see her come to terms with what happened. I have to say that a lot can happen in twenty four hours as this book shows. 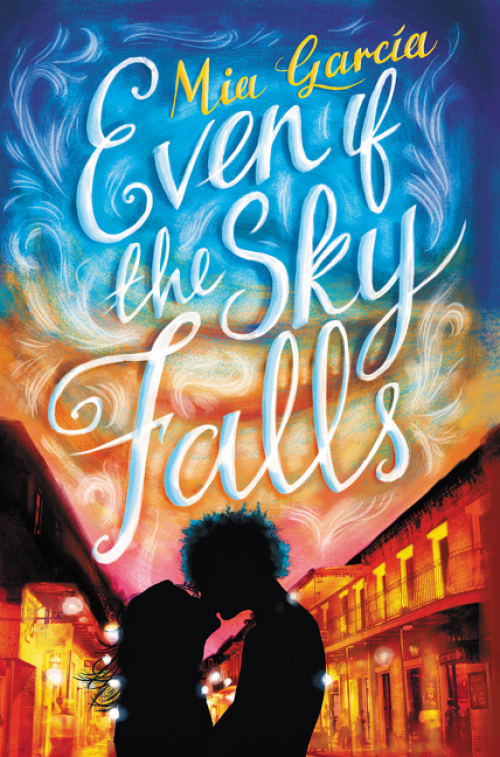 Even If The Sky Falls has not only a beautiful cover, but a decent romantic storyline. When Julie meets Miles, she thinks okay, this is just for fun. No pressure. She lets herself open up to him and be unguarded because at first she figures she won’t see him again. However as the storm goes on, they get to know each other. They find that they have things in common. And well, they really like each other. Unfortunately, there’s this thing that happens. And you root for them against the odds. I think that if you’re into stories where you feel vested in the outcome of a hookup, you’ll love Garcia’s book.